Tim’s story reminds us to celebrate life, let go of emotional baggage, find a support network, meditate, spend time in nature and go for a walk. 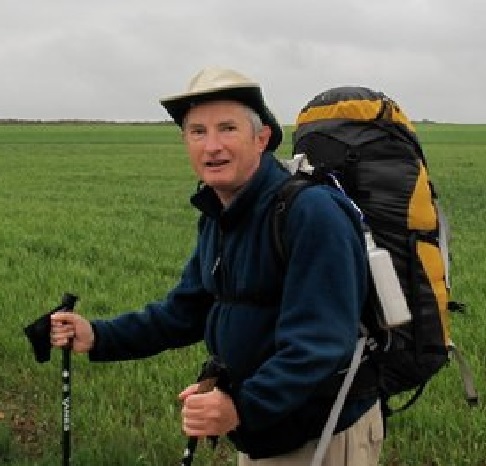 Timothy Phillips walked the Camino Frances from St.Jean-Pied-de-Port to Santiago de Compostela in 2010 and 2015 to celebrate 60 years and 65 years respectively. He walked a different route this past spring from Seville to Santiago. This is his account of a trek which became for him an important voyage of introspection: a physical journey which is also metaphor, dealing with the twists and turns of life, following some wrong paths, learning the need to travel lighter, finding clarity, peace and a place of healing along the way. We can transcend our history, become unstuck and flourish. This is the basis of the book he wrote entitled “My Camino Walk – A Way to Healing” (IslandCatEditions) available through Kindle, Kobo and iTunes and as a print book through Amazon.